Melandru’s blessing to the most devout of her followers was to become one with nature and leave behind their physical construct. Pay tribute to and learn from the druid spirits in Draconis Mons to cultivate your relationship with nature through the Druid Stone. 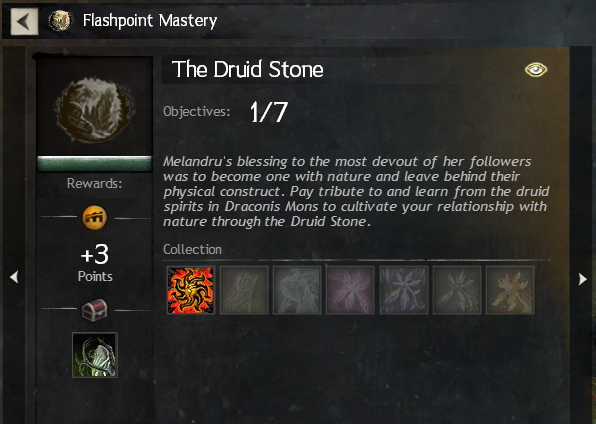 After completing the final instance of Flashpoint, you receive a consumable item called Volcano’s Heart, which unlocks The Druid Stone collection. In order to get started, double-click the consumable Volcano’s Heart which will complete the first step. Obtain a Druid Runestone by combining 5 Druid Runestone Fragments (sold by heart vendors in Draconis Mons). 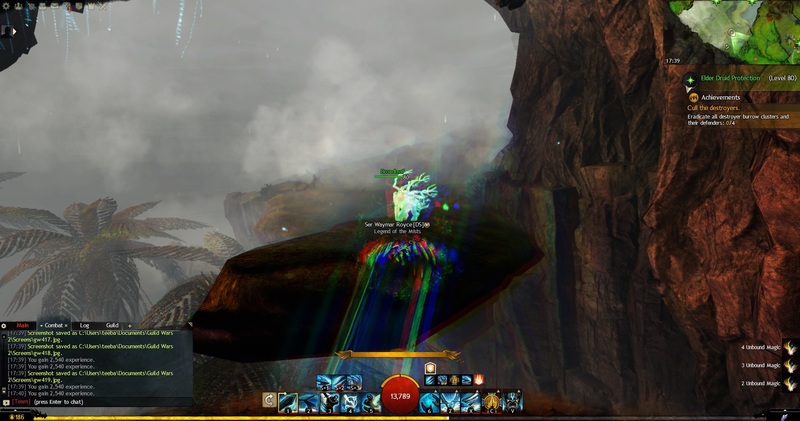 Bring a Druid Runestone to Kodama in the Savage Rise area of Draconis Mons. 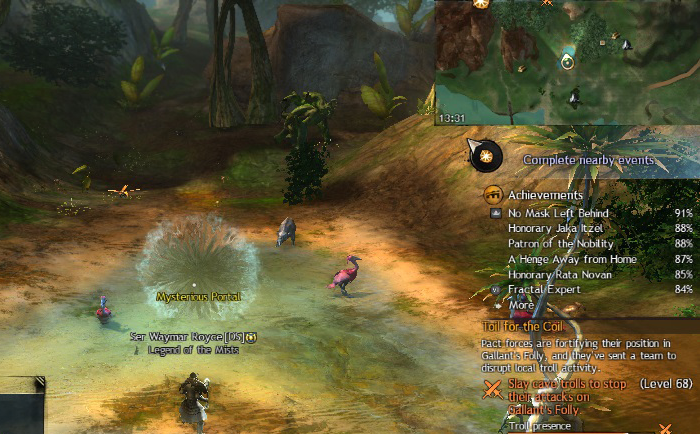 Bring a Fire Orchid to Kodama in the Savage Rise area of Draconis Mons. 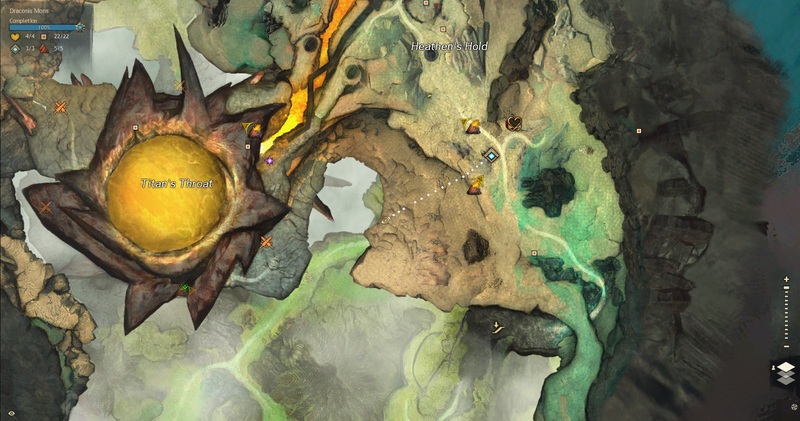 Bring a Fire Orchid to Liriodendron in the watering hole of the Savage Rise area of Draconis Mons. 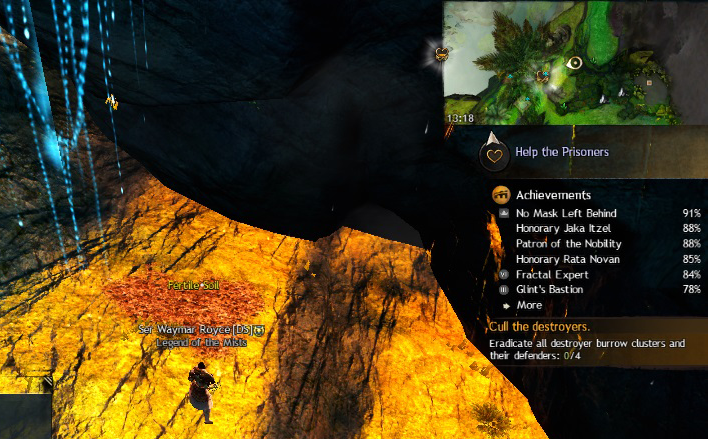 Bring a Fire Orchid to Broadleaf, on a ledge above the Savage Rise area of Draconis Mons. 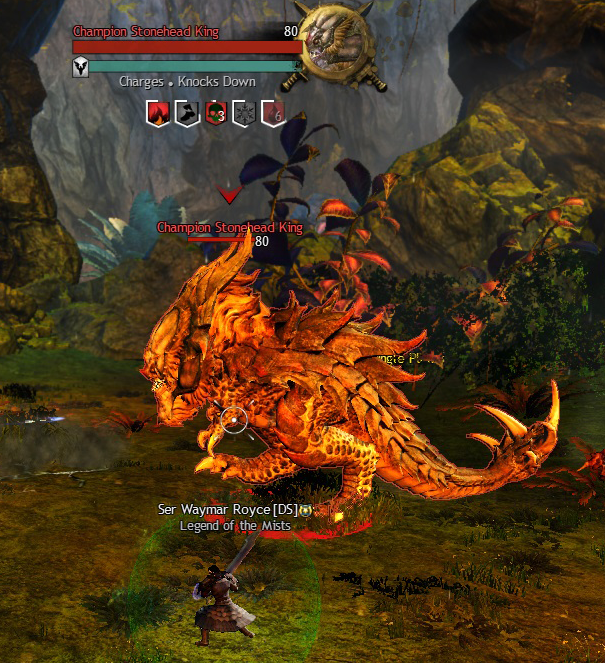 Bring a Fire Orchid to Rosewood on a ledge above the Ancient Hollow in Draconis Mons. Druid Runestone Fragments are sold by heart vendors in Draconis Mons, but you can only purchase one from each vendor at a cost of 1050 karma. Remember you can also purchase one from the vendor at the first waypoint; Mariner’s Landing waypoint (note: this however costs 1050 unbound magic, not karma). Once you have 5 of these fragments, double-click them to combine them into a Druid Runestone. NB: For the subsequent steps, remember to bring 4 Fire Orchid Blossoms – the new map currency mined from Primordial Orchids in the zone – as you need to turn one in to each of the 4 druids you are going to. Kodama resides in the Druid’s Grotto. This seems to be the PoI most people struggle with in the new map. 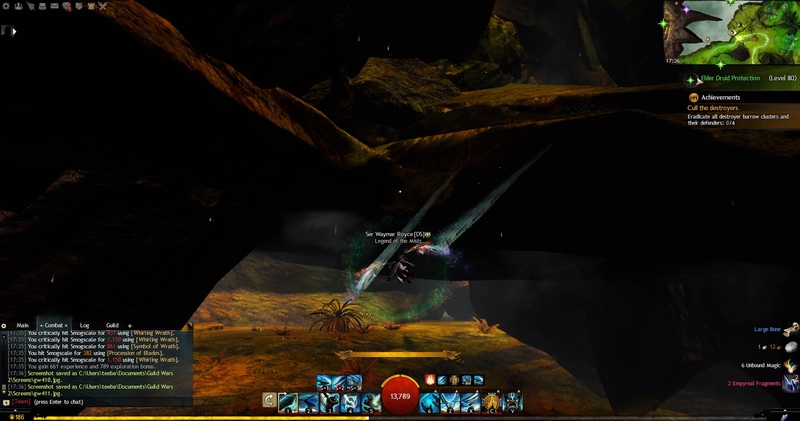 Getting there is very simple; from Heathen’s Hold waypoint run west and drop off the ledge, then continue to drop beyond the level down and be ready to bring out your glider. Run across this platform and through a nook to enter a grotto that opens before you, and find Kodama towards the back of the cave. From a lore perspective, here is an interesting piece of information on the druids. Kodama’s words are also contrary to previous notions the druids mysteriously disappeared from both the Maguuma jungle and the Henge of Denravi. Now, however, the dialogue suggests the druids chose to leave the Henge, and after they did, they created and protected gardens throughout the world. The druid Liriodendron resides at the point of interest called Peace Garden; in the northeastern corner of Savage Rise just beyond the flat area with stoneheads. In a secluded garden, you will find Liriodendron sitting in the middle of a shallow pond. Hand over a Fire Orchid to complete the step. Broadleaf – the druid – sits on a ledge overlooking Wind Rider Ridge. The easiest way to get there is taking the 2 Thermal Tubes from Heathen’s Hold waypoint, first up to the apex of the volcano and then the next from there towards Rata Arcanum. 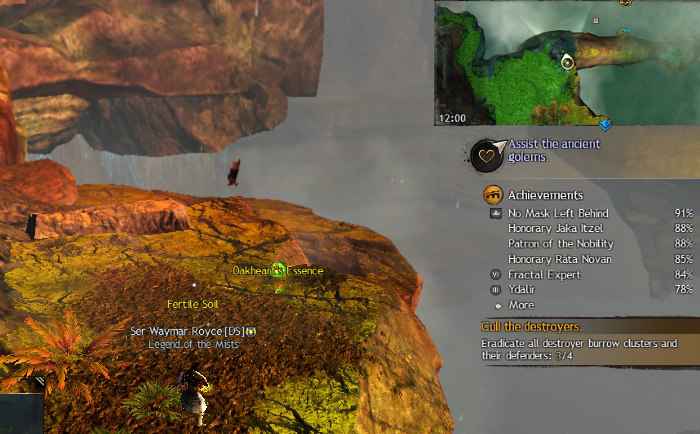 However, drop one more level down from Rata Arcanum to find Wind Rider Ledge. Once there, grab an Oakheart’s Essence and grapple up to the high rock where the ley-line comes out of the western edge. Follow the ley-line to where it stops and glide down on the ledge to find Broadleaf, then hand over a Fire Orchid to complete the step. This druid is possibly the easiest and quickest get to. Simply go to Ancient Hollow waypoint, go to the bouncing mushroom immediately northwest at the foot of the massive root branch coming out of the ground. Bounce up – or use Oakheart’s Reach grapple – to the platform above and you will see Rosewood sitting on an edge overlooking the area. Give Rosewood the 4th and final Fire Orchid Blossom to complete the Druid Stone collection. When all these things have been done, the Druid Stone collection is complete and you will receive the Druid Stone backpiece as a reward. Continue to cultivate your relationship with nature through tributes to the druid spirits of Draconis Mons. At the same time, the next collection Awakening the Druid Stone is unlocked, which will grow the Druid Stone back piece to a Living Druid Stone back piece. Obtain the Druid Stone back item. Acquire the Element of the Wardbough, which is dropped by the Champion Wardbough found at the POI Eternal Pool in Draconis Mons. Then purchase another 5 Druid Runestone Fragments, combine them to make a Druid Runestone, then combine that with the Element of the Wardbough to make a Wardbough Runestone. Take the Wardbough Runestone back to Kodama, in Druid’s Grotto, and present it to the druid, who in turn will give you a Wardbough’s Rest. Acquire the Element of the Arbor, which is given by the Restless Arboreal Spirit found at the Hidden Lake hero challenge in Brisban Wildlands. 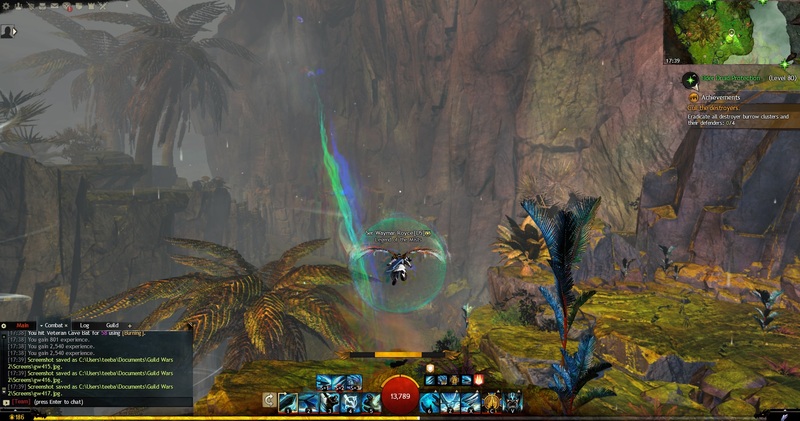 Seraph’s Observer waypoint is closest. Then purchase another 5 Druid Runestone Fragments, combine them to make a Druid Runestone, then combine that with the Element of the Arbor to make an Arboreal Runestone. Take the Arboreal Runestone to Kodama, present it to the druid and be given an Arboreal’s Rest in return. Acquire the Element of the Oakhearts, which is dropped by the Ancient Rotting Oakheart found at the Greatheart Weald PoI in Queensdale. Phinney waypoint is closest. Then purchase another 5 Druid Runestone Fragments, combine them to make a Druid Runestone, then combine that with the Element of the Oakhearts to make a Oakheart’s Runestone. Take the Oakheart’s Runestone to Kodama, present it to the druid and be given an Oakhearts’s Rest in return. 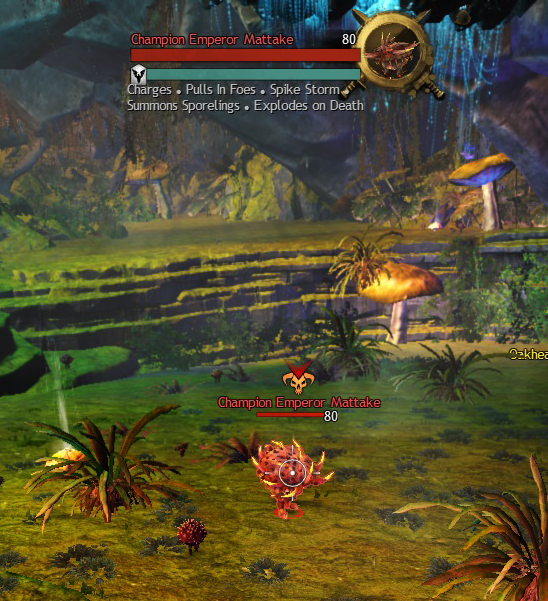 Return to Kodama in Draconis Mons and present 3 Fire Orchid Blossoms (“a bouquet”). 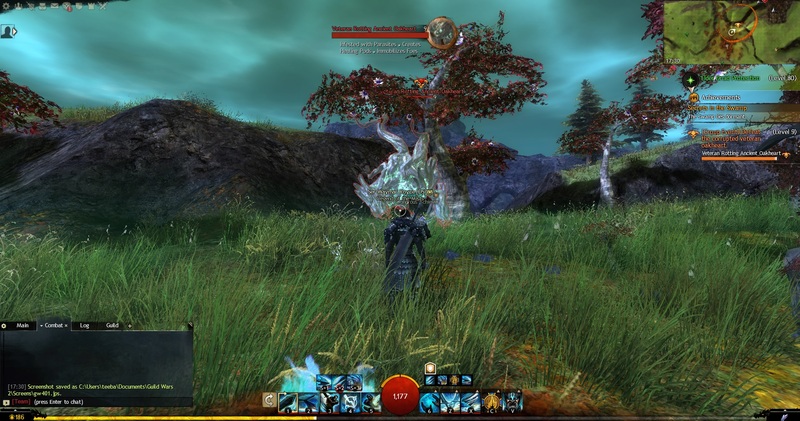 Return to Liriodendron in Draconis Mons and present 3 Fire Orchid Blossoms (“a bouquet”). 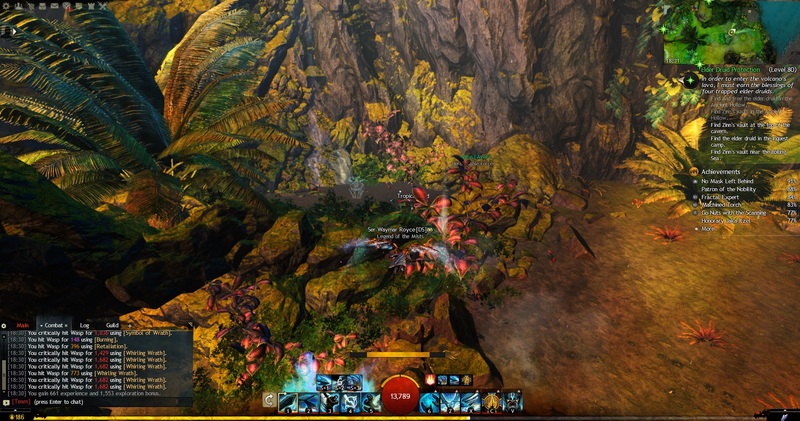 Return to Broadleaf in Draconis Mons and present 3 Fire Orchid Blossoms (“a bouquet”). Return to Rosewood in Draconis Mons and present 3 Fire Orchid Blossoms (“a bouquet”). This will complete the Awakening of the Druid Stone collection and unlock a third collection that will further grow the Living Druid Stone into an ascended back piece. 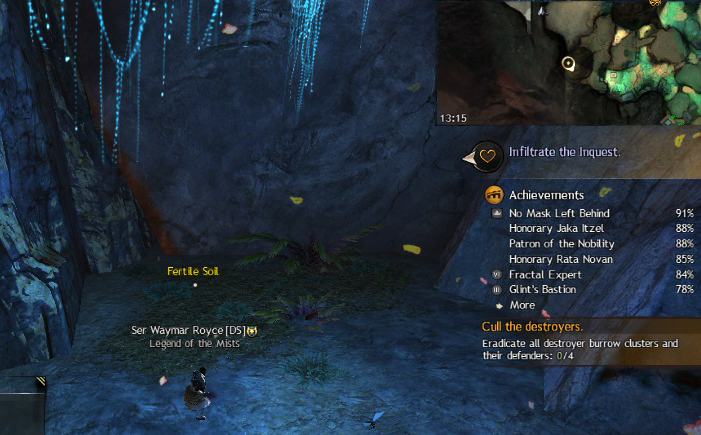 The next set of achievements for further growing the Living Druid Stone to its ascended counter-part, The Wayfarer’s Henge, requires obtaining five new element items from various champion creatures found in Draconis Mons. In addition, another 5 druid runestones are required – so keep up completing daily hearts to purchase those fragments; this is the time-gated part that will slow down completing this collection the most. This guide will be extended with information once the collection is unlocked; as the druid runestones are time-gated in acquisition. Updated May 6th: Having got my 3rd Druid Runestone, I unlocked this collection today and can now proceed working on my druid backpiece. 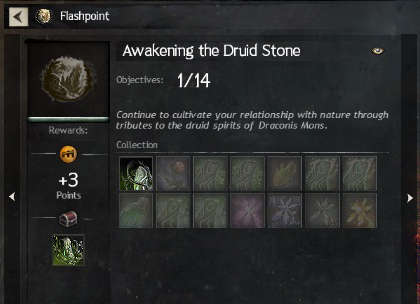 Completion of all the steps of Sprouting the Druid Stone will reward players with Tier 3 backpiece, named Blooming Druid Stone, after which the final collection will reward players with the ascended backpiece, The Wayfarer’s Henge. So, let’s get to work on the third collection. 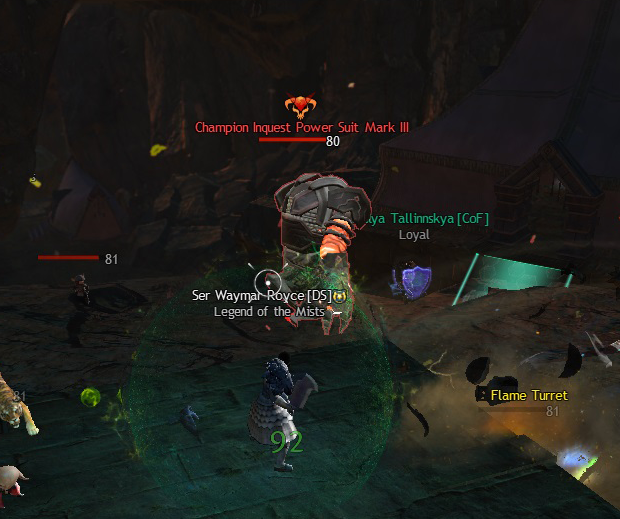 Kill a champion mob in Draconis Mons and it will drop an Element that corresponds to its being. Combine this Element item with a Druid Runestone to create a Runestone. Take the Runestone to Kodama to receive a Rest item corresponding to the Runestone. 2. – 4. Kill the Stonehead King in Savage Rise (steppe above Druid’s Grotto PoI), Draconis Mons and receive the Element of the Saurians. Combine with Druid Runestone to receive a Saurian Runestone which Kodama will trade for a Saurian Rest. 5. – 7. Kill Emperor Mattake due east of Ancient Hollow waypoint, in Draconis Mons and receive the Element of the Empire. Combine with a Druid Runestone to receive an Imperial Runestone which Kodama will trade for an Imperial Rest. 8. – 10. 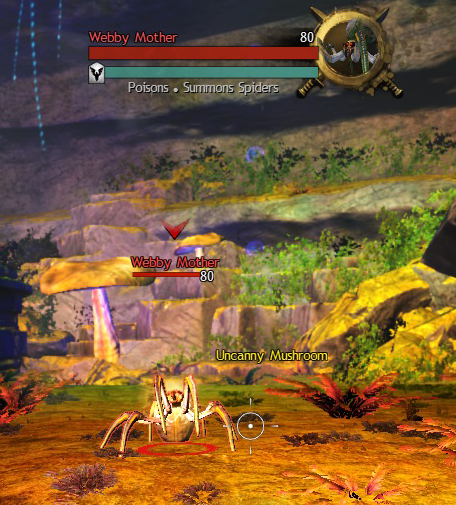 Kill Webby (Mother) near Ancient Hollow waypoint, in Draconis Mons and receive the Element of Webby. Combine with a Druid Runestone to receive a Webby Runestone which Kodama will trade for a Webby Rest. 11. – 13. Kill the Bloodstone-charged Lava Wurm near Heathen’s Hold waypoint in Draconis Mons and receive the Element of the Wurm. Combine with a Druid Runestone to receive a Wurm Runestone which Kodama will trade for a Wurm Rest. 14. – 16. 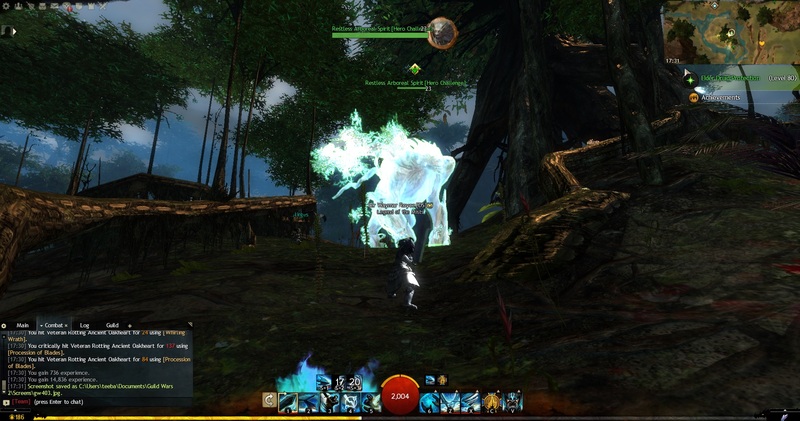 Kill the Inquest Power Suit (Golem) in Rata Arcanum, Draconis Mons and receive the Element of Arcanum. Combine with a Druid Runestone to receive an Arcanum Runestone which Kodama will trade for an Arcanum Rest. As before, in similarly increasing quantities, steps 17. – 20. requires you to bring 5 Fire Orchid Blossoms to the four druids Kodama, Liriodendron, Broadleaf and Rosewood. In addition, each druid requires a lodestone this time, as follows. 17. Bring Kodama 5 Fire Orchids and a Charged Lodestone. 18. Bring Liriodendron 5 Fire Orchids and a Glacial Lodestone. 19. Bring Broadleaf 5 Fire Orchids and an Onyx Lodestone. 20. Bring Rosewood 5 Fire Orchids and a Molten Lodestone. 21. The final step requires planting a Fire Orchid Seed in the fertile soil next to Kodama in Druid’s Grotto. The Fire Orchid Seed can be harvested from Primordial Orchid nodes, when the Sprouting the Druid Stone collection is active. Once you have completed this collection and you have your Blooming Druid Stone, the 4th and final tier of this collection will unlock, A Henge Away From Home. Your dedication to nature is proving fruitful, but there is still much to do. Continue to show respect for Melandru’s druids and help bring their magic out into the world again. This collection has 31 steps; the first of which completes with the acquisition of the Blooming Druid Stone back piece which is the reward for completing Tier 3. The second item of this collection requires you complete the Flashpoint meta achievements and have received the Houndskin Mantle shoulder piece reward. If you were not accustomed to how this collection works yet, you will learn it now. 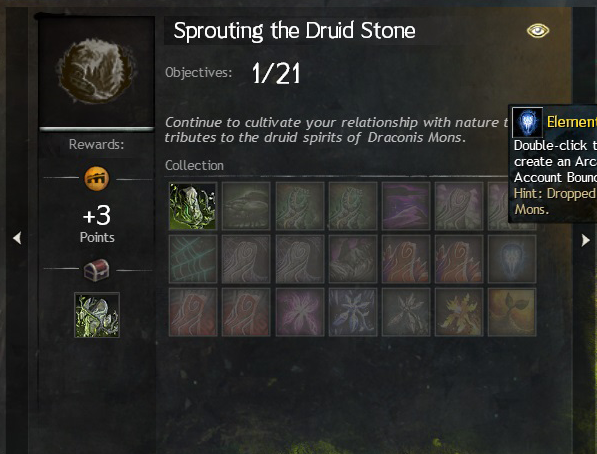 Regardless, for this collection you will require a total of 7 Druid Runestones, so keep working on the daily hearts in Draconis Mons for another week. This brings the tally to a total of 16 days required to fully complete the Druid Stone back piece from start to finish, resulting in The Wayfarer’s Henge. 1. Kill one or more champion mobs to receive an item encapsulating their Element, then combine with a Druid Runestone to craft the matching Runestone, and complete by turning in to Kodama, the druid spirit in Druid’s Grotto to receive the Rest counterpart. 2. Bring 10 Fire Orchids along with 5 of a type of Lodestone to the 4 druids in Draconis Mons. 3. 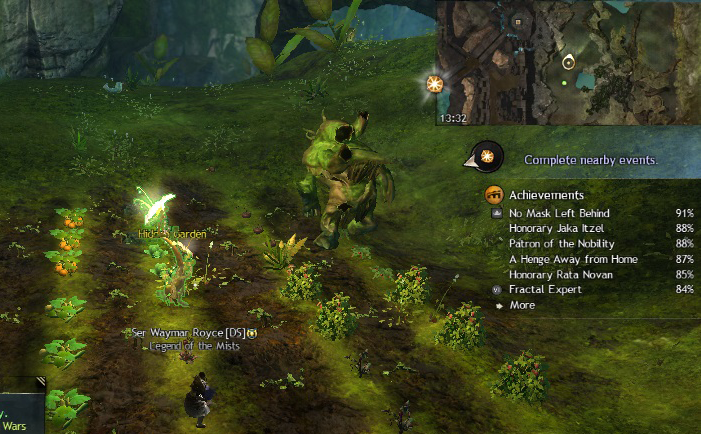 Plant Fire Orchid Seeds in the fertile soil at various locations in Draconis Mons and in some other locations in Tyria. The first 16 steps of the collection deal with acquiring Elements of certain mobs, combining with Druid Runestones you can get 1 per day in Draconis Mons to create a Runestone, and finally turning in to Kodama to receive the Rest counterpart. There are slight modifications to how the final step is done for this collection, so let’s check the steps in detail. 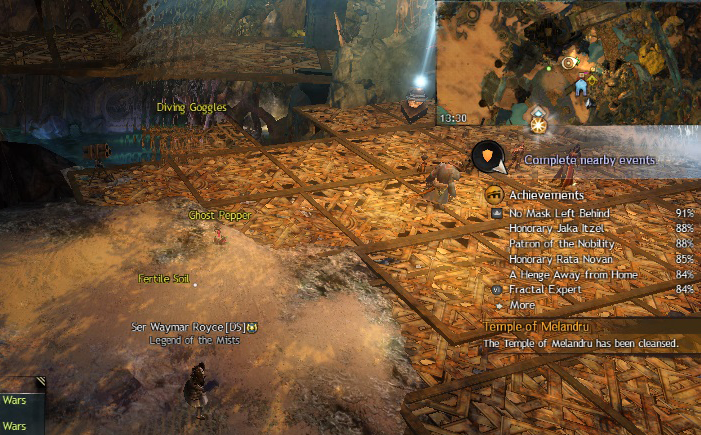 Kill the Legendary Destroyer Aestus in Draconis Mons to receive the Element of Aestus (collection item #3). Combine the Element of Aestus with a Druid Runestone to receive the Aestus Runestone (collection item #4). 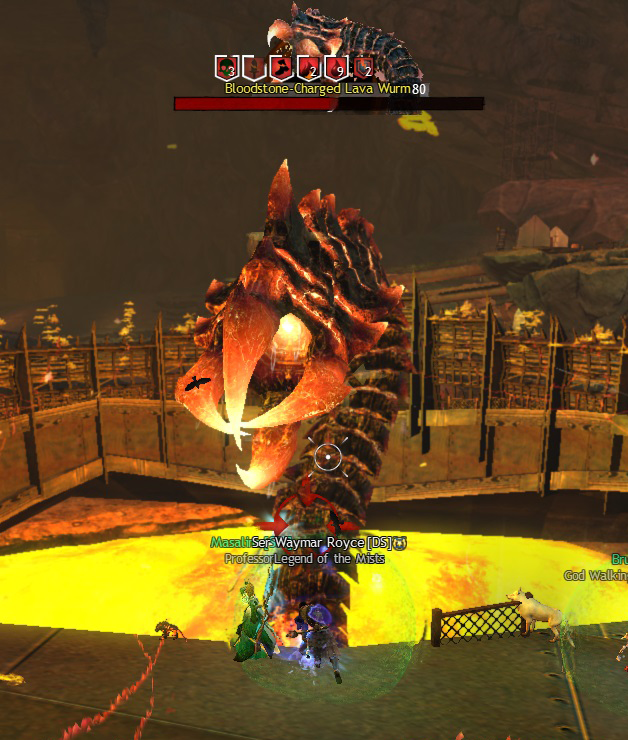 Kill the Legendary Destroyer Ignis in Draconis Mons to receive the Element of Ignis (collection item #5). Combine the Element of Ignis with a Druid Runestone to receive the Ignis Runestone (collection item #6). Kill the Champion Molten Desecrator (found during the event Defeat the destroyer champion and the destroyer burrows) in Draconis Mons to receive the Element of the Desecrator (collection item #7). Combine the Element of the Desecrator with a Druid Runestone to receive the Desecrator Runestone (collection item #8). Bring the Aestus Runestone, Ignis Runestone and Desecrator Runestone to Kodama in Druid’s Grotto to receive the Destroyer’s Rest (collection item #9). Kill Fire Elementals to receive the Element of Fire (collection item #10). Combine the Element of Fire with a Druid Runestone to receive a Volcanic Runestone (collection item #11). Kill Ice Elementals to receive the Element of Water (collection item #12). Combine the Element of Water with a Druid Runestone to receive a Glacial Runestone (collection item #13). Kill Air Elementals to receive the Element of Air (collection item #14). Combine the Element of Air with a Druid Runestone to receive a Charged Runestone (collection item #15). Kill Earth Elementals to receive the Element of Earth (collection item #16). Combine the Element of Earth with a Druid Runestone to receive a Earthen Runestone (collection item #17). Bring a Volcanic Runestone, a Glacial Runestone, a Charged Runestone, and an Earthen Runestone to Kodama in Druid’s Grotto to receive the Elemental Rest (collection item #18). For this section of the collection, once again you must bring “bouquets” of Fire Orchids to the four Druid Spirits in Draconis Mons. For their locations, refer to The Druid Stone section at the beginning of this guide. The five steps of this section are the following. Bring a Vision Crystal to Kodama in Druid’s Grotto. Bring 10 Fire Orchids and 5 Charged Lodestones to Kodama in Druid’s Grotto. Bring 10 Fire Orchids and 5 Glacial Lodestones to Liriodendron in Peace Garden. Bring 10 Fire Orchids and 5 Onyx Lodestones to Broadleaf on the ledge above Wind Rider Ledge. Bring 10 Fire Orchids and 5 Molten Lodestones to Rosewood near Ancient Hollow. 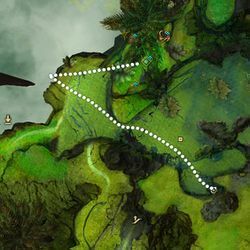 The remaining steps revolve around planting Fire Orchid Seeds – remember you needed to keep the ones gathered previous tier – and you will require a total of 15 Fire Orchid Seeds to plant around Tyria. 9 seeds require planting in 3’s in the old world whereas the final 6 are planted in Fertile Soil patches around Draconis Mons. So, let’s get on with our lesson in gardening. Dierdre’s Orchard. Plant 3 Fire Orchid Seeds in the Hidden Garden of Dierdre’s Steps in Mount Maelstrom. If you have not been there before, entry to this closed off requires killing one of 3 special mobs spawning in Mount Maelstrom. Personally, I find Keeper of the Waves being the one I can get to most easily. Maguuma Orchard. Plant 3 Fire Orchid Seeds in the garden of the oasis in Dry Top. Melandru’s Orchard. 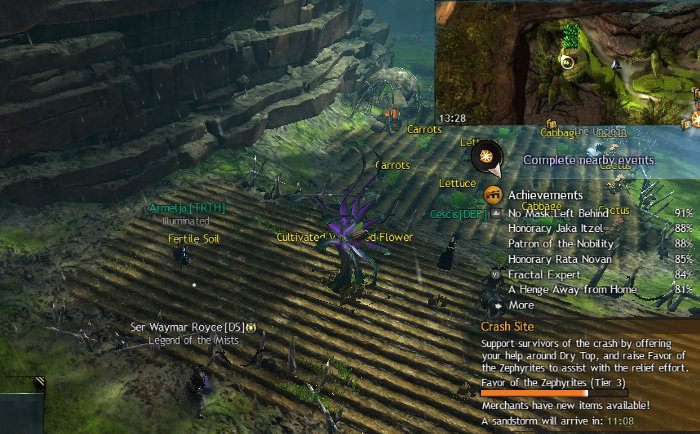 Plant 3 Fire Orchid Seeds at the Cathedral of Verdance in Cursed Shore. This patch of Fertile Soil is at the rocky outcrops at the foot of a larger island in the Eastern Boiling Sea. Start from Ancient Hollow Waypoint, walk to the edge south-east and drop down to the largish island directly below. 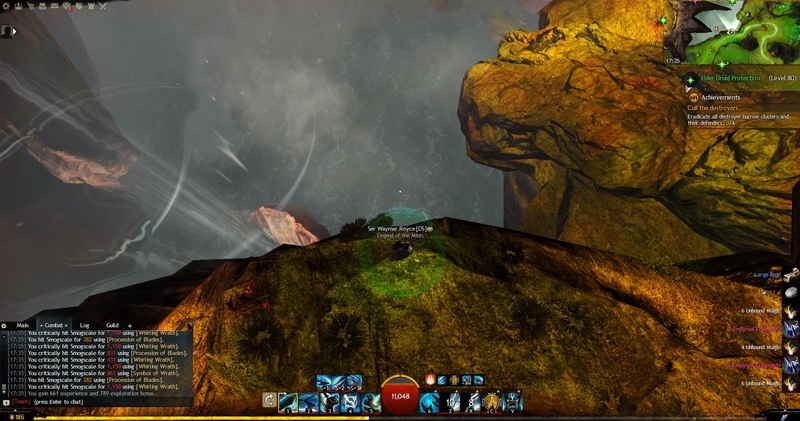 Easiest way to get here is from Heathen’s Hold Waypoint, take the immediate Thermal Tube to the Apex, then the next towards Rata Arcanum, but drop down 2 levels and glide towards the Wind Rider Ledge. 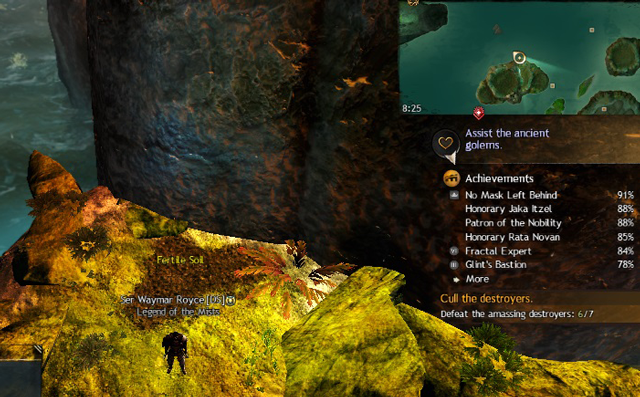 Find an Oakheart’s Essence and the nearby updraft and grapple your way up to this little ledge. 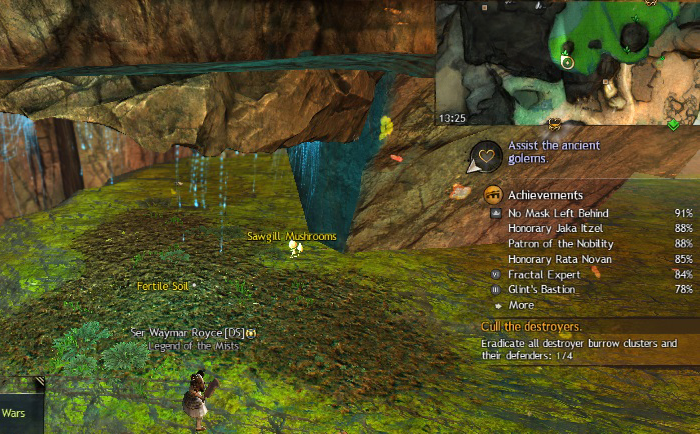 This Fertile Soil patch is inside a bioluminscent cave with Grubs, just north of Rata Arcanum. Again, if you have taken the Thermal Tube from (#5) to get here, you can simply glide to the cave entrance, or you can go to the Inquest Lab where the Golem Mark II Power Suit event takes place, pick up the Oakheart’s Essence and grapple up in the air and glide over to the cave entrance just north and above. To get to this Fertile Soil patch, follow the same path you would take to Druid’s Grotto, but instead of entering the grotto, run north/north-west on the ledge past the grubs. Hug the wall and a small cave will open up towards the east. As in #5, getting here is easy if you take the two Thermal Tubes starting from Heathen’s Hold Waypoint. 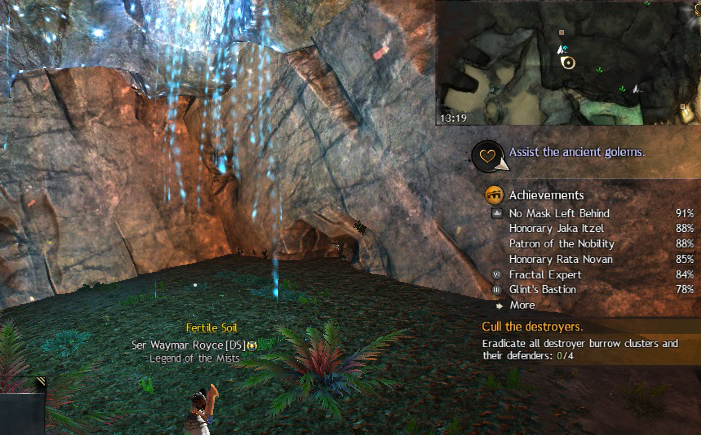 You will land by the entrance to the Nu II vault, and the Fertile Soil patch is deep inside the cave. Finally, from Ancient Hollow Waypoint, go a bit south/south-west and find the Bouncing Mushroom behind a high rock. Take this and the next 3 Bouncing Mushrooms to land on the ledge where a cave opens with lots of mushroom mobs, but also Speed Boost Mushrooms to buff you and get you through to where the cliff opens and overlooks the Boiling Sea below. You will have to fight some Mushroom mobs to clear the space unless you’re quick to plant the Fire Orchid Seeds under stability boons. That is it, you are finished and the owner of a druid-inspired ascended backpiece which you can choose among most relevant prefixes (Berserker, Viper, Magi, etc.) you could wish for. Final note: Remember also that if you have been looting many Fire Orchid Seeds when you’ve been gathering the Primordial Orchid nodes, you can turn in these for Fire Orchid Blossoms at a 5:1 rate (5 Seeds =at the vendor by the Mariner’s Landing Waypoint. If you made it all this way, feel free to drop a line if you have some thoughts on this guide, or if you liked this collection and the backpiece, etc.